Florence is the city that is known for Michelangelo, the Medici’s and the famous Duomo, just to name a few. Most have heard of it and few would struggle to recognize its remarkable landmarks. Florence is the capital of Tuscany and the birthplace of the Renaissance. Its population is just under 400,000 and it’s full of culture and beauty, rendering it the embodiment of the Italian lifestyle. There are many things to see and do in this beautiful and historic city. True to the Live Like a Local mission and vision of A Toast to Travel, there are noteworthy must-see sites in Florence on the other side of the Arno River known as Oltrano. “Oltrano” means beyond the Arno. Many travelers to Florence tend to stay in the historic area and do not venture across the bridges to this great area and because of this; they miss out on some truly great sights. Piazzale Michelangelo- This Piazzale boasts of probably the best views of Florence. It is a beautiful area to sit at a café and indulge in an aperitivo with some light snacks while you admire the beauty of Florence in the background with the Duomo and all her glory. It is a bit of a hike to get to this area if you are walking from the historic area of Florence, but it is well worth the effort. This is arguably one of the best views in the city. The Palatine Gallery- Everyone has heard of the Uffizi and the Accademia, but there is another beautiful museum located inside the Pitti Palace just over the Ponte Vecchio. 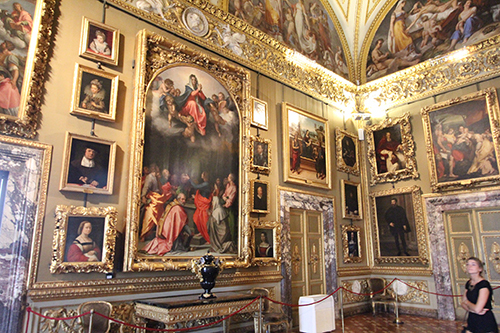 The Palatine Gallery is home to over 500 beautiful paintings, most from the Renaissance period. The Gallery itself looks more like a history lesson on the History Channel. Pitti Palace was also the residence of the famous Medici’s an Italian banking family and political dynasty. Boboli Gardens– Encompassing 11 acres of greenery, the Boboli Gardens is one of the largest public parks in Florence. 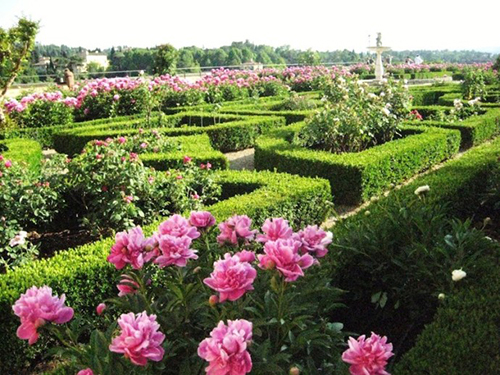 The garden is very easy to find as it is attached to the Palazzo Pitti. The Boboli Gardens include ancient Roman statues and even a beautiful grotto. 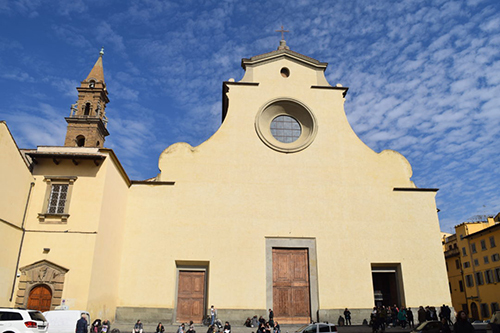 Santo Spirito- Although the formal name is Basilica of S. Maria del Santo Spirito, this church is often simply called Santo Spirito. A passerby may overlook this church and keep walking, but they would be missing out on a true work of art. Designed by Brunelleschi, it is definitely worth a look. The exterior was never completed, but venture inside and admire the Latin cross and its 40 side chapels. Also, be sure not to miss the beautiful frescoes in the transept. These are just a few of the Oltrano highlights. Our recommendation is to travel with experts in the area. Traveling with experts who love what they do and know what it is like to Live Like a Local will provide you a local’s view into the true Italian culture and leave you with a truly memorable Experience. Live Like a Local with A Toast to Travel! A Toast to Travel a US registered service mark based in, and operating solely from the United States. Live Like a Local is a service mark of A Toast to Travel LLC.